RDS/RBDS decoder with optional FM stereo receiver. You can choose between a 4x20 character LCD or a smaller graphical LCD to display data. A simple RS232 interface can also be used. 3rd row: Radio Text Line A (RT) 64 scrolling characters. 4th row: Radio Text Line A (RT) 64 scrolling characters. All major parts are available from our online shop. Schematic & pcb (Eagle 4.11e), hex file available. Last updated on December 12, 2007. The actual RDS/RBDS Decoder with the PIC and the display. The FM Stereo tuner with headphone amplifier. If you want to build this decoder into an existing tuner, then you won't need to rebuild the tuner part of the circuit. All you need to do then is to look for an MPX-signal in your existing tuner. This is usually found before the stereo decoder chip. This MPX signal must then be fed to the TDA7330 through a 47nF capacitor. The circuit needs a couple of seconds of valid RDS/RBDS data before driving the LCD. Digital tuning and volume control: the joystick gives us to have full control over the circuit. Last values are stored and reloaded on boot. You'll have to choose a 4x20 character LCD or a smaller graphical LCD to display data. The smaller graphical LCD is best suited for portable applications, whereas the larger 4x20 character LCD is best for fixed receivers (f.e. in your car). Which display is driven can be chosen when booting: joystick-left for the 4x20 and joystick-right for the smaller LCD. TDA7330 RDS/RBDS decoder chip. Needs an MPX input in order to decode RDS/RBDS data. PIC18F452-I/L PLCC This Microchip PIC microcontroller does most of the work: it looks for valid RDS data, then drives the LCD. Graphical LCD Nice little graphical LCD LPH7779 (Nokia 3310 LCD) Low power and best for portable use. Contrast adjustment by pressing volume up or volume down whilst booting. LCD Module 4x20 Standard 4-lines x 20-characters LCD module. Best choice for fixed receivers. TDA7040T Philips PLL Stereo decoder. Needs only a couple of external components. TDA7050T Low power stereo headphone amplifier. Small package and low power but still good quality. Controls With the micro joystick, there are 5 user controls available. Two for volume (up & down) , tuning (left & right) , save preset (push). MCP41010-I/SN 256-step 10k SPI digital potentiometer for tuning. A multiturn potentiometer is a (more expensive) alternative. MCP42010-I/P Dual 256-step 10k SPI digital potentiometer for volume control. Replaces a double stereo potentiometer. All coils use 0,5mm diameter coated copper wire and measure 5mm in diameter. L1, 78nH: 8 windings, little spacing. L2, 56nH: 5 windings, more spacing. 021v05.sch (Eagle 4.11e), May 20, 2006.
eagle_lbr3.zip (Important: copy these to your \eagle\lbr directory). Includes these libraries: dig_pot, lph7779, pic18f4x2, tact-smt, tda, varicap. 021v06.brd (Eagle 4.11e), May 26, 2006. 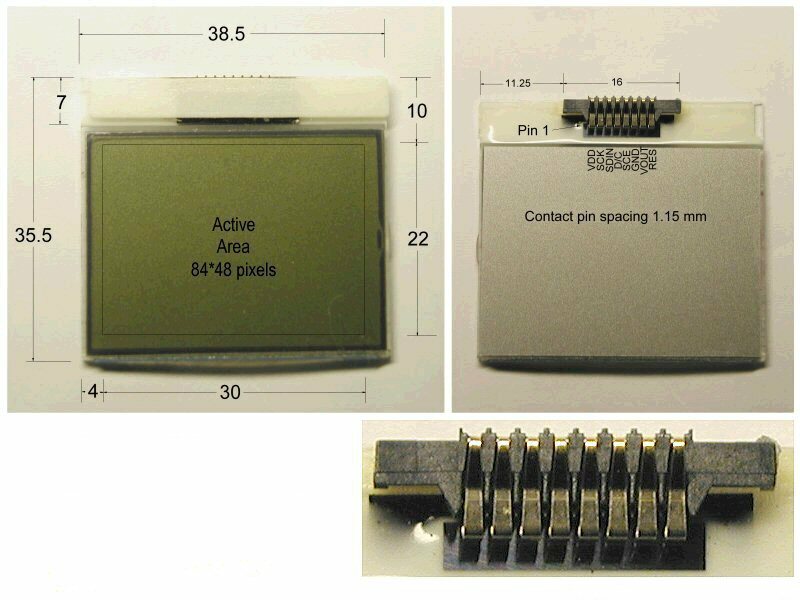 Graphic LCD module type LPH7779 (NOKIA 3310 LCD) 48*84 pixels and its integrated controller PCD8544. MCP41010-I/SN SO-8. Single digital potmeter. MCP42010-I/P DIL-14. Dual digital potmeter. Check out our development tools page.